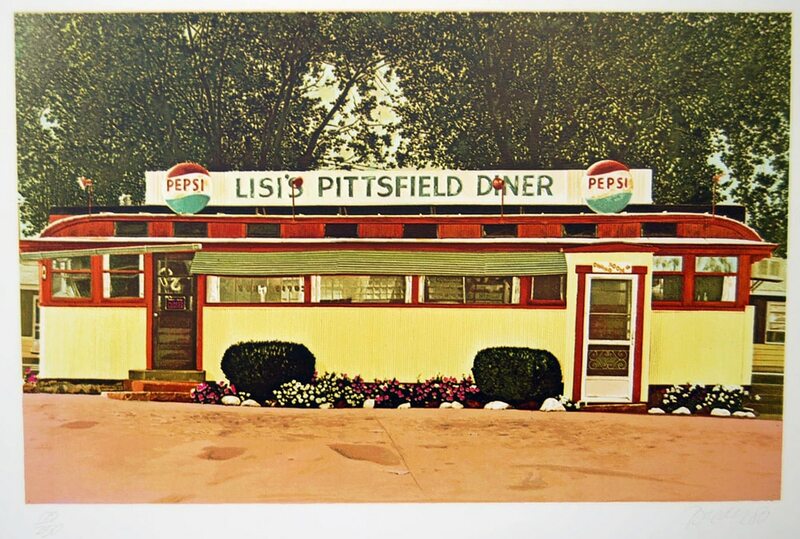 John Baeder’s calculated and nostalgic renderings of “classic Americana” theme-diners have brought him great appeal and success both as painter and printmaker. Baeder’s subjects have been almost exclusively isolated roadside diners and eateries. That an artist can concentrate so masterfully on one theme enticed Abrahms to publish “Diners by John Baeder” in 1978. “In Photo-Realism, reality is made to look so overpoweringly real as to make it pure illusion: through the basically magical means of point-for-point precisionist rendering the actual is portrayed as being so real that it doesn’t exist. What does exist off the canvas is the mind, which conceived of the idea of the painting of a photograph of reality, in all its intrinsic implausibility. Whereas classical painters through the ages have idealized reality itself, the “classical” New Realists have totally devalued reality in order vastly to overvalue (in other words, completely abstract) the human brain.” Gerrit Henry , “Super Realism: A Critical Anthology” (Dutton 1975).